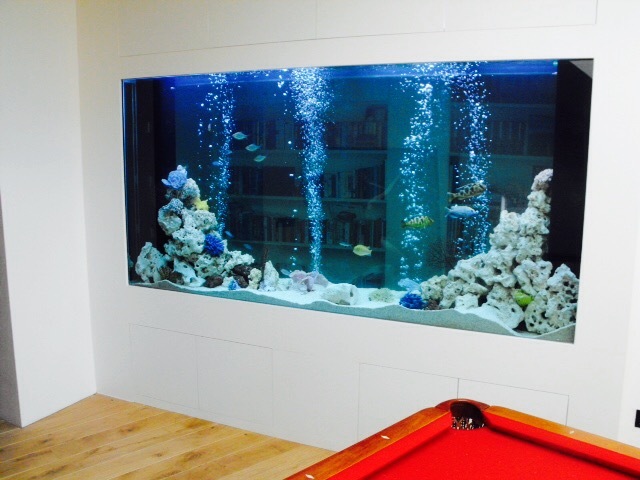 This room divider aquarium was incorporated into the basement of a new build house to form a divider between a bedroom corridor and a games room. Our client asked for an aquarium which would resemble a sea water aquarium but that due to limited space for filtration is actually a fresh water tropical aquarium. We used ocean rock, sea fans, barnacle clusters and a number of artificial corals in order to introduce some colour to the internal scheme. The fish are mainly African cichlids and the scheme is compelented by a high powered air pump producing four powerful bubble streams.